This year, in conjunction with the Tunbridge Wells Museum and Art Gallery, a number of postgraduate students from the School of History have been co-curating an exhibition to commemorate the centenary of the First World War. ‘Back to Blighty: The Medical Front in Tunbridge Wells’ focuses on the healing of wounded soldiers in Tunbridge Wells, with particular reference to the use of various local stately homes as auxiliary hospitals and places of convalescence for wounded servicemen. The project has involved archival research to find personal testimonies from the soldiers and nurses who were recovering and working in Kent throughout the First World War, in the hope of linking these individual stories to the stately homes local to Tunbridge Wells. Undertaking research with Tunbridge Wells Museum staff Jeremy Kimmel and Elizabeth Douglas. Following the completion of the archival research, there was an opportunity to think creatively about the way the exhibition should look. This included discussions about the housing of a number of interesting artefacts, which depict some of the ways that the successful healing of wounded soldiers was accomplished at Tunbridge Wells. Examples of the potential exhibits considered, included: the X-Ray of an arm shattered by a bullet wound, a soldiers medical kit, and a V.A.D nurses uniform, as well as a wide variety of photographs of men who were recovering from the injuries sustained at war. The exhibition, therefore, tracks the journey of the wounded soldier from injury on the battlefield and the immediate medical attention they received, to their return to England and the beginning of their journey to recovery. The exhibition will open on Friday 25th July 2014 and runs until January 2015. This entry was posted in Events, News, Projects, Student volunteers and tagged Tunbridge Wells Museum, Voluntary Aid Detachment on July 23, 2014 by zd30. Following a call for volunteers sent out to the University of Kent by the Archivist at Canterbury Cathedral, work began on preparing a First World War Centenary Commemoration display for open evenings at the Beaney Museum and the Nave of the Cathedral. The research began with a selection of material held in the Cathedral Archives which consisted mainly of wartime letters and some objects. There was also some existing research available specifically on HMS Kent that had been compiled by other volunteers at the Archives. 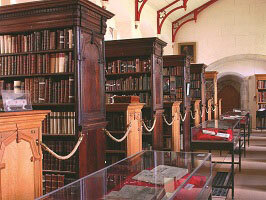 Canterbury Cathedral Library and Archives. This was the centre for the project and was where much of the research took place. 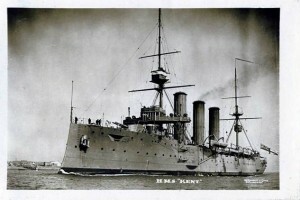 HMS Kent. The ships involvement in the Battle of the Falkland Islands in 1914 was the main focus of the naval research. 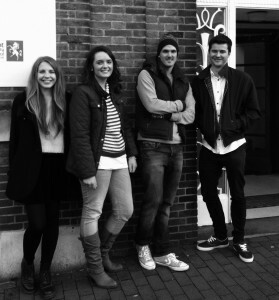 The project from the off had a specific focus on local history and telling the ‘Soldiers’ stories’. It was decided that the research should cover the local area’s contribution to the war, with reference to the local Regiments, Pilots, Sailors and Civilians. As such, the challenge lay in searching the records for a range of local stories that encapsulated the whole war as much as possible. 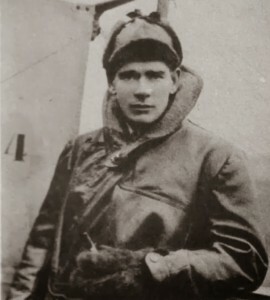 The research revealed that Mick Mannock and James McCudden – two of the most notable ‘air aces’ of the war – were local to Canterbury and Kent. This provided a great start to the project. 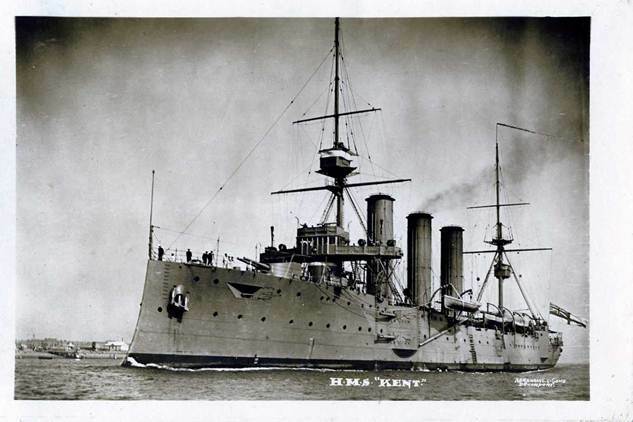 Also available was a paper on HMS Kent, which had already been the subject of research in relation to its role in the Battle of the Falkland Islands. The biggest challenge was the local Regiments, which certainly proved to be the most difficult part of the project. After sifting through casualty records and cross referencing names, dates and events, some little known stories were unearthed which – it is hoped – will enable the public to gain a better insight into the lives of the men of Kent during the First World War. 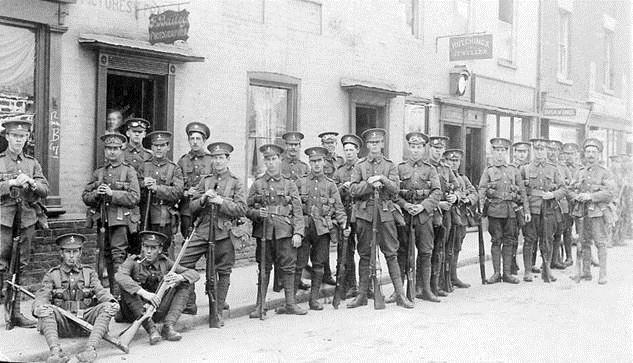 Members of B Coy, the Kent Cyclist Battalion pose in Castle Street, Canterbury in 1914. 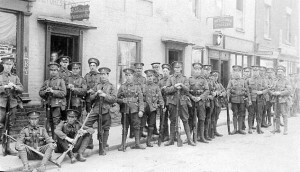 They would be sent to India in 1916 as a dismounted infantry battalion. Major Edward “Mick” Mannock was discovered with thanks to the Canterbury Historical and Archaeological Society (CHAS), ‘Canterbury’s very own Red Baron’. Finally the civilian organisations – the Voluntary Aid Detachment (VAD) Hospitals and Canterbury War Work Depot – were brought in to give a wider view of the war effort at home and abroad. 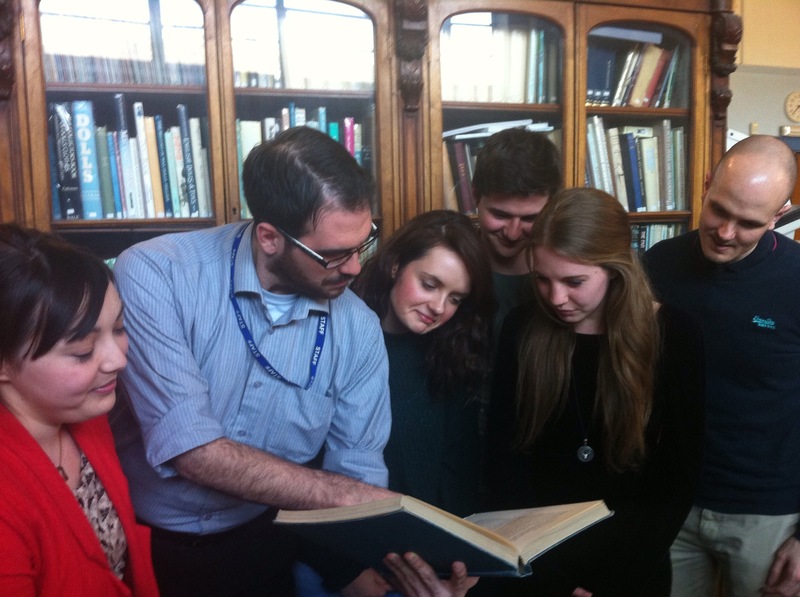 Research was also undertaken into ‘memorial and commemoration’ in Canterbury. The unveiling of the East Kent Yeomanry Memorial, High Street, Canterbury, October 1922. The research has now been formatted into display boards and is in production. 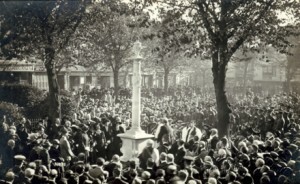 It is hoped that the display will be showcased, along with objects from the Archives, in the Cathedral in early October and will help inform the public of the local history prior to the main commemorative events the following month. From start to finish the project has been of great benefit to the volunteers involved and has given the students of History a chance to take part in a research project in the historical sector during a very poignant point in the commemorations of the First World War. This experience will be of great benefit in the future. Ruben Rees is a War Studies student at the University of Kent, about to begin the final year of his undergraduate degree. Images courtesy of Canterbury Cathedral Archives. This entry was posted in Projects, Student volunteers and tagged Beaney Museum, Canterbury, Canterbury Cathedral, Ruben Rees, UoK students, Volunteering, War Studies on July 17, 2014 by zd30.